Please refer to our stock # vj201051 when inquiring. 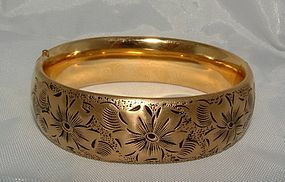 Wide bangle bracelet from the art deco period in yellow goldfill, opens on side, circumference is 7.1 inches. Width is 7/8 inch. Excellent condition.